A former Apple (s aapl) engineer is the latest to argue that the giant consumer-electronics company he used to work for should acquire Twitter, an argument that has been made a number of times in the past year or so. But Patrick Gibson — who worked on the original iPad — isn’t saying that Apple should buy Twitter just so it can make its apps and services more social: he thinks Apple needs to acquire it because the company lacks the ability to understand or design web-based services that actually work. Could Twitter fill the holes in Apple’s DNA when it comes to the internet? The case against Apple isn’t difficult to make, as even die-hard Apple lovers will admit if you speak in a whisper or ask them after they’ve had a few drinks. As Gibson notes, there is the ongoing usability train wreck that is iTunes, which even long-time Apple users find has a habit of suddenly deleting music and other content with no warning and is actively user-hostile. Then there are social elements such as Ping and Game Center, which are virtual ghost towns (Ping was recently euthanized) and the grand-daddy of them all — the beast previously known as .Mac and MobileMe, now known as iCloud. In an attempt to bolster its social features in the wake of the disaster that was Ping, Apple signed a partnership with Twitter that made the service the social plumbing inside virtually all of Apple’s products (and has since signed a similar arrangement with Facebook). Given that it already has that kind of relationship, there seems to be little rationale for Apple to acquire Twitter outright — as financial columnist Barry Ritholtz and others have argued in the past. Having advanced his theory, Gibson then goes on to list all the reasons why it probably won’t happen, including the fact that Twitter probably wants to stay independent and try to justify its estimated $10-billion market value, and Apple is “too in denial about the failings of its antiquated approach to the web to consider dropping such a huge amount of money.” As it becomes more and more of a media company, Twitter is also likely to lose some of the engineering talent that would make it worth acquiring, Gibson says (something he argues is already happening). That said, it’s an interesting idea. There is no question that Apple’s biggest shortcomings lie in the area of web services, and there is no sign of it attacking that problem in any real way, although some Apple fans are hoping design guru Jony Ive will be able to help now that he is taking over responsibility for the usability of all of Apple’s products, as opposed to just the hardware. Merging cultures is never easy, but Twitter may be the closest thing to a plug-and-play solution for the company — unless of course Apple wants to reach for the stars and make a takeover bid for Google itself. This is strangeâ€¦ Why would a technology company like apple even try to buy a huge waste of time, like Twitter? Apple does not need to be social. It just needs to continue making awesome products. Apple have bigger problems to deal with beside social media. The iPhone and iPad are incremental improvements on the ipod Touch. Where is Apple’s next innovative project going to come from? I’d like to see Twitter stay private and possible become a crowd-funded open source project like Wikipedia. Anyone else feel the same? I would *FAR* rather see Google buy Apple than it happening the other way around. It would also make a lot more sense, and be far more possible. I have seen an article on phdguy website http://www.phdguy.com about future of web and death of google and facebook. Twitter has got to be the most expensive way to “learn about services”. Twitter itself is an utterly confused company that doesn’t know where it’s going right now, that is annoying its users so much that they start alternate services. Just like Facebook, Twitter is always just one idea away from oblivion: Somebody could start a better service tomorrow, and it could take off. Nothing that they do is very unique – the only thing unique is the position they’re in and the number of users they already have. Apple will probably do what it’s already doing, buy up startups that are cheap and full of talent. Network effects are so hard to duplicate though… I honestly think Twitter users are staying put. If they’re getting value out of it today, they won’t leave for a different service just because it’s available, and most likely said future service will post to Twitter, too, anyway. You’d need to create a Twitter for a different market, of non-current-users of Twitter; Yammer did this. Yammer didn’t take a single user away from Twitter on its march to $1.2bn. Why should anyone buy twitter ? They are like Reuters for the web age. A MS twitter or Apple Twitter would be a kiss of death. Apple is doing fantastic with its app store, software purchase & update on the web. The point is reliability & speed of contact, email, music, document synchronizing for individuals and businesses. One size doesn’t fit all: end users want simple stuff, businesses want fine tuned & secure. Agreed ! Acquisitions can easily destroy value. Pretty much only Google->YouTube has made 1000% sense so far. Apple does not understand the multi-user, collaborative, sharing world, in general. If UNIX didn’t have a strong underpinning for multi-user, then OS X would still be a single user system or a complete disaster. Take a look at the mess that is Apple ID’s. Did you know that you cannot â€“ under any circumstances â€“ merge Apple ID accounts? I have to help many people get through the pains of an Apple ID that resets itself and the user can no longer access. Usually, it ends up with me telling the user to just make a Genius appointment and let them get the job done. Then, look at the iWork apps and web storage. They had something headed in the right direction with the iWork.com beta. At least you should share documents and get feedback (however poorly the system was for integrating that feedback into the document), but it wasn’t real collaboration like you see with Google Docs. Then they went and killed off iWork.com for cloud storage of iWork apps documents. However, there is now no collaboration â€“Â pitiful. I’m a huge Apple user. And I am disgusted with Apple’s incompetence in the collaborative world that we have today. They truly do need to get their act together. I agree they are missing a huge opportunity now that they are entering large corps with the BYOD trend. OS X server is a diamond left in a closet. They are big enough to expand their products matrix and keep things simple for consumers and yet offer groupware for small businesses. Unless the folks making corporate IT purchasing and standardization decisions suddenly stop being so dogmatic and clueless, you’ll never see Apple target that market in earnest. Consumers are far more rational and ultimately make better customers. It’s also easier to innovate when you’re not beholden to the enterprise. I guess you can’t be good at everything… Apple is laser focused on it’s iOS platform, and its hardware. With that laser focus comes an inability to do many other things, like truly “get” services the way Google gets it. Apple’s Internet services have been quite successful with the 80% of us – the mainstream consumers. Casual users, which is the Apple target, don’t need Dropbox or sophisticated collaborative capabilities. The only files most people outside of the corporate environment really want to share and collaborate on are photos. Shared Photo Streams absolutely nails it. Facebook dominates the space. Enhancing collaborative capabilities in iWork simply isn’t a priority for Apple because its not a dominant use case. I’ve worked in the field of collaborative technology for 15 years and can tell you absolutely that its nearly impossible to get corporate users to leverage even 10% of the functionally that exists within Microsoft’s and IBM’s platforms. It’s some pretty powerful stuff too. People simply aren’t comfortable working that way. They’d prefer to collaborate via the inbox which is an absolute mess. Interesting, but no guarantees. At one point there was a really great app available for Blackberries called Viigo. Blackberry bought it, and promptly ruined it. Just sayin’. 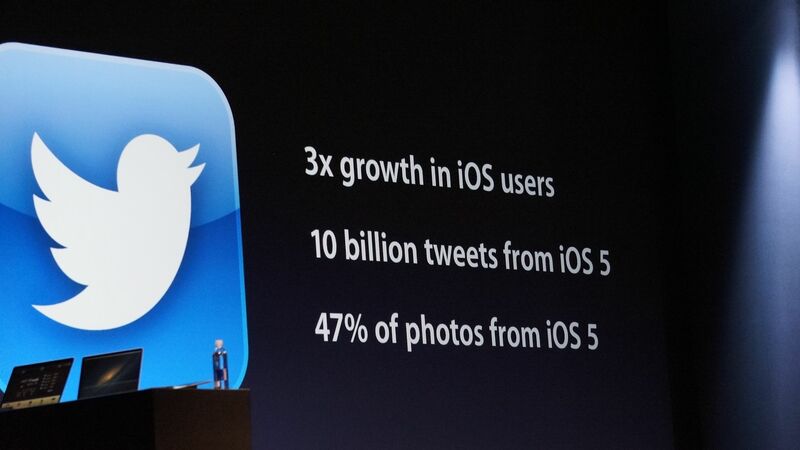 Buying Twitter would not solve Apple’s problems. Everything Apple has is built on WebObjects. WO is designed around the idea of a central authoritative database. At some point, a WO app will hit “the wall” where that single database can no longer handle the load. Twitter, Google, Amazon and others solve this problem with partitioning… multiple databases share the load. WO does not do eventual consistency, map/reduce, or schema-less data, and Apple has steadfastly refused to open source WO so those of us who still use WO can fix it. WO was a brilliant system 15 years ago, but now it is a liability in a world with full duplex WebSockets and continuous queries a la Twitter Storm. If they can’t get Twitter what about Dropbox? Dropbox would be a lot cheaper than Twitter but it has quickly established itself as part of the strategic infrastructure of the internet. Better yet the guys at Dropbox really know how to design simple web interfaces that just work. Dropbox is getting too big in the head and decided not to be friendly with apps in the Apple ecosystem. I find it strange that companes like Box or Sugarsync are getting better and play well with reader apps – I am only referring to the mobile platform. No doubt Dropbox is the easiest to use but being not able to play well with others makes it a minus in my opinion. Looks like all of us are better than Appe in how to make their business works. Yes we are the arm chair gurus and they are clueless. And I wonder why Apple ex employees are bad mouthing the company now and if they were that good I believe they should be SVPs now instead of still being in the rank and file. Google Play is superior to iTunes? In what universe, because it’s not this one. Apple does understand the internet well but the basis of their closed approach will perhaps be their downfall. How can they possibly develop at the same pace as the rest of the open source world combined. Point in case being Google Maps – what a stupid decision – you simply cannot be a master of everything and it is better to sacrifice a bit of profit to provide truly the best product on the plant – which they have probably still just about achieved this time around regardless. The point is for how long. Siri shows ambition but does anybody actually use it? – I tried and got frustrated in 2 minutes of feeling like a complete idiot – it’s crap and it is not ready for release. Sorry – that’s not related to the post – just venting aimlessly. The Apple/Twitter fit isn’t even remotely a good one, despite what Twitter could teach Apple. I read not long ago that Twitter has more than a million apps / third party functions that support or are built on Twitter technology. Twitter is about innovation through realtime collection of information. The Twitter stream itself has already created a reservoir of untapped knowledge whose value cant yet be seen. The apps and functions around Twitter exist to make value of the Twitter stream come alive. Twiiter is the new keeper of history while Apple is a giant, temporary player in the long term timeline of technology. Twitter’s long term value is incalculable and it would be short-sighted to even consider a sale to Apple. you sir, just hit the spot. What’s up with these immature/sensational/false articles? To “figure out how the internet works”? Really? Sure, Apple isn’t perfect in this regards, but really? They only have the most successful online appstore on the planet, most successful digital music store, media store, and the most ambitious and thorough cloud service i’ve ever used (iCloud) while although has had some pains, has always worked perfectly for me, for everything from syncing, to backups, to restoring, photostream, gaming, imessage, game save syncing, etc. iOS users are well known to be much more bandwidth heavy than any other user, and Apple has built some pretty impressive infrastructure to support this massive demand. I’m pretty sure they ‘get’ the internet, and nothing will ever work perfectly for everyone due to the sheer complexity of whats being done and the numerous variables. But buying twitter? Ridiculous idea, not to mention the premise is idiotic, since Apple has been doing infinitely more ambitious cloud related endeavours long before twitter was even created. I agree. Even though .Mac was less than perfect, it allowed all my Macs to sync their data in the cloud long before it was called the cloud, and long before anyone else was doing it. Google’s products are often in “beta” stages for long periods of time and are hardly ever pretty. Gmail has to be one of the ugliest interfaces on the internet, and it’s had its share of growing pains. Let’s not forget that everyone – Google, Apple, Microsoft, HP, Sony, Dell – have had their shares of missteps and problems. I think Apple’s “cloud” problems are mostly over-exaggerated by click-hungry bloggers. Apple has a very good single-user approach. They are getting better with multi-user stuff, but not nearly fast enough. However, the rest of the world (Google, Microsoft, Salesforce.com, Facebook, Twitter, etc) all do things much better in a multi-user, collaborative world. Apple’s success has been because of some great content deals and some single-user software/services (not to mention fantastic hardware) that was much better than what we had before. However, their community stuff has always sucked â€“ and continues to do so. @J Scott Anderson there exists an element of utter genius in what you have written. Apple is a hardware company that makes stuff for one user, as opposed to, say, FB, which is useless if only one user were on it. iCloud is actually quite nice. All core functionality is solid. Documents could be more robust but at least they’re solid. iTunes Match started off shaky but has settled into a really nice service. All memes aside, where are they struggling with Internet services? You mention Game Center being a ghost town but I’ve got tons of non-gamers that are quite active in my network. Can’t find any reason to agree to the article , Mathew Ingram. Apple may now have the money to buy Twitter. It’s not like buying Sparrow for its talent. What does problems with cloud products have any relation to talent at Twitter. To get talent Apple need not buy Twitter, but pulling some body key from Twitter would be enough and save the kitty also. Have found lot of speculation like this recently looking at the cash balance Apple has. Sure Apple should spend 1k $ on something they can get for 5$. Twitter would be a big buy for a very poor reason.The user base is also of little use being so US focused. But in the end,Apple doesn’t do big buys and that is unlikely to change. Twitter would be such a great fit for Apple but they would need to keep things open for other platforms. Google would be something I would love to see but I doubt the regulators would let that happen.